Ellison Park Cyclocross P/B Full Moon Vista Race #1 saw Jeremy Powers take the win on the men’s side and Kaitlin Antonneau do the same for the women. 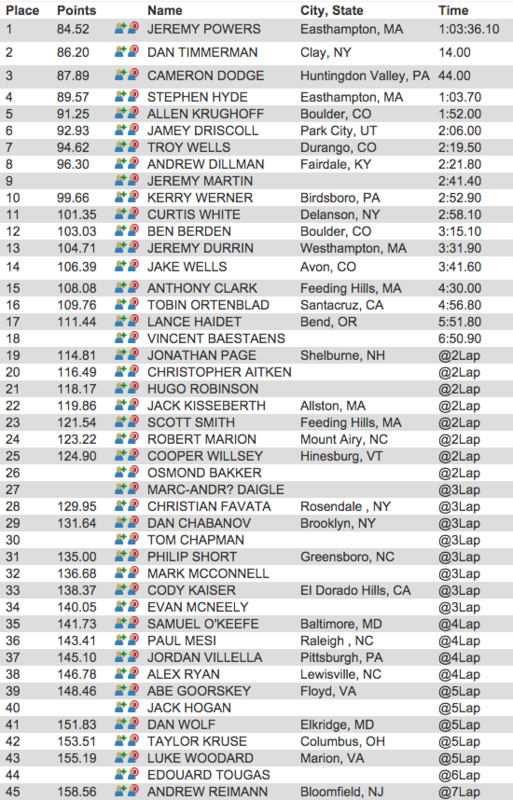 Full results for the men are here. 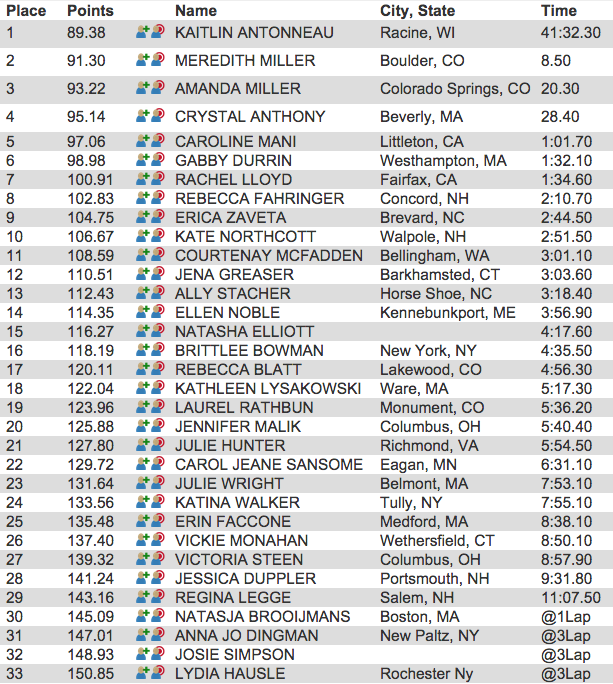 Full results for the women are here. We will have full coverage after the weekend. In the meantime, the day was not without controversy as the UCI’s July 2015 change to Rule 5.1.038 caused a lot of confusion as it received its first test on an extremely hot day. The rule change eliminates feeding during a UCI cyclocross race. 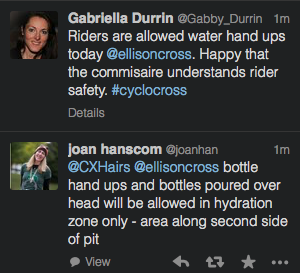 The UCI officials at Ellison Park did not allow feeds in the pit, per the rule, but they also did not allow riders to have bottles on their pit bikes. Riders were allowed to start the race with a bottle on their bike but bottles were not allowed on new bikes received after an exchange. Ellen Noble, who rides for J.A.M. Fund and was among the pre-race favorites, was fined for having a bottle on her pit bike. This ruling, according to UCI cyclocross commission member Helen Wyman, appears to be a misinterpretation of the rule. After seeing many women abandon the pro race because of the heat, the officials allowed a “splash zone” to be set up for the men’s race. Riders could be doused with water as they passed this zone. Frustration with our sport is not a new issue, and really not one to get worked up over. Normally, I don’t use energy to debate these points on my social channels because it takes away from my racing, so often, I have opinions of these mini-dramas but to avoid the time that goes into them, I walk away. When it impacts the health and, truthfully, common sense, I get frustrated and want to write, but I want it to be impactful and worth the energy to debate publicly. As fans of any sport, there is always some drama. Right now, it’s motor bikes hitting riders and unsafe courses in road racing. In cyclocross, it’s u-turns being banned and not allowing feeds during the races. *(De)Hydration* is an issue I want to stomp out. I’m upset about it. I feel banning feeds was the wrong decision and would like actions to clarify the rules, but also I want the elite cyclocross community (who this impacts) to voice their opinion for a rule change. In my opinion, the only real solution for this is a fully dedicated bottle pit, a lane designated only for bottle hand-ups. After having spoken to a slew of riders, mechanics & managers at the last two weekends of racing, it seems like that’s the right action step moving forward if feeding in the bike pit isn’t going to work anymore. Feeding is only an issue for about 45 days of the cross season. Rarely do we need to feed through October, but as the world continues to warm & the race season starts earlier each year, it’s only gotten worse, which is why the rule needed to be put in place to begin with. The fact is that cross races are in open fields with low air flow, direct sun, 100 degree heat / humidity. Races now touching the 70 minute mark. I don’t think the outcome of the races should be based on whether one rider can dehydrate less than another and skip bike changes: that’s just dangerous and irresponsible. Bike changes are slower and in cyclocross, races are won by seconds. When I see riders with goosebumps, chills, headaches, vomiting after races, that’s not right. We need to fix this in a constructive way and voice our opinion on this. I would say to the folks who say ‘just put a bottle on your bike,’ that’s an option, but thats not the answer. Several riders lost bottles yesterday because we’re riding bikes without suspension and the courses are technical, this is not road racing. Smaller frame sets can’t be picked up with a bottle. No frame can be carried properly with a bottle on it. 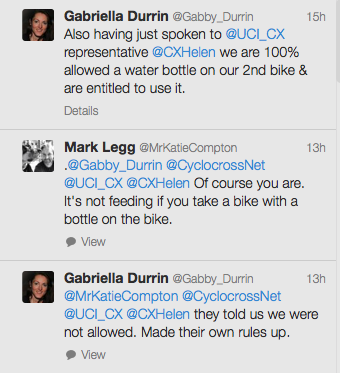 To add to that, fines were being issued to riders taking bikes with bottles on them in the women’s race, which I strongly disagree with. Jeremy’s position was supported by his colleagues such as Wout van Aert and Philip Walsleben. We will keep a watch on today’s race to see how the rule is interpreted on what promises to be another hot day at Ellison Park. Chances are (at least we hope so), this will all be a moot point come Monday. It’s less the need to drink water. 1 bottle is enough. More important to dump cold water on your body, only way to cool down and not allowed with a no feeding rule.